Presenting the new 2018 rims from the manufacturers at American Racing Custom Wheels for your hotrod or cars that you wish were hotrods: AR920 with its simple but refined Charcoal and Satin Black finishes. AR924 in sleek Graphite and luxurious Satin Black. AR926 with its eye-popping Chrome or elegant looking Gloss Black with milling and lastly, AR927 Barrage in classic Satin Black finish that will provide your vehicle with wheels that will break necks as you drive by. From the race track to the streets, the one constant in these wheels is there ability to innovate. American made and American named, it’ll be impossible to have a glimpse of the models being produced by American Racing without wanting to throw your money at us to get wheels from this company. 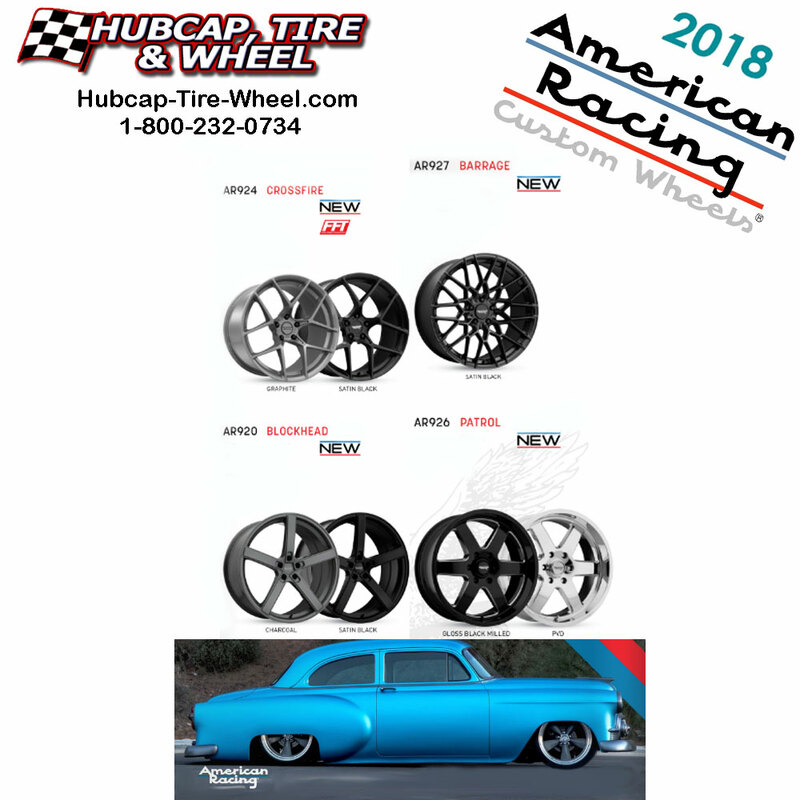 If any of these wheels from the American Racing Wheels catch your attention or you have questions about sizes and fitting, please call us so we can assist with your wheel purchases. 1-800-232-0734 is our number. Our wheel and tire experts can help you with any question you might have. Getting proper fitting wheels and tires can be tricky, that’s why you should always talk to our experts first. With so many bolt patterns and offsets to choose from, we make sure you get the right wheels. Our wheel and tire experts are available 8:30am-6pm EST Monday through Friday and 10am-4pm EST Saturday. We also have guaranteed fitment or your money back. That way you know you are ordering from a trusted company. We have been in business since 1985 and selling on the web since 1999. Be sure to click on the link above to see all the sizes, colors and prices. We offer FREE shipping anywhere in the continental U.S. if you order a set of wheels or a set of wheels and tires.